Studies abroad allow interaction at educational, linguistic and cultural levels and represent an experience of global learning that the Escola Superior de Conservació i Restauració de Béns Culturals de Catalunya (ESCRBCC) continuously strives to maintain. The ESCRBCC offers an extended Erasmus modality, which recognises Erasmus study grants as well as apprenticeships at Universities or Higher Eduction Centres with whom an agreement has been signed. Also, the ESCRBCC has signed a protocol of Exchange and a General Agreement of Academic Cooperation with the Universidad del Museo Social Argentino (Buenos Aires-Argentina). This is a general agreement of academic, scientific and technical collaboration, on the basis of which students of both institutions will be able to take part in exchanges of academic mobility. The Erasmus Lifelong Learning Programme allows students to spend a period of studying and learning at European Universities with whom exchange agreements have been established, allowing them to enjoy diverse educational experiences as well as experiences in personal growth. Encouraging student mobility simplifies the recognition of titles at a European level and promotes the constant exchange of knowledge, aiming to give students the best possible advantage when entering the labour market. The Escola Superior de Conservació i Restauració de Béns Culturals de Catalunya ESCRBCC is a public centre monitored by the Department for Education of the Government of Catalonia. Created in 1991, the school offers Advanced Studies in Conservation and Restoration of Cultural Heritage, adapted to the European Higher Education Area (EHEA) standard. The ESCRBCC offers an extended Erasmus modality, which allows for student exchange programmes for the purposes of study as well as apprenticeships, with teachers also participating in teaching exchanges. ACESEA. Spanish Association of Institutes of Higher Artistic Education. AFEDA. Association for the Promotion of the Binding of Art. CRAC. Associated conservators-restorers of Catalonia. Grupo Español IIC. Spanish Group of Conservation. International Institute for Conservation of Historic and Artistic Works. Since 2000, the ESCRBCC has published the Conservation and Restoration magazine UNICUM, with direct participation by the students in its editing and publication, this being a useful platform for alumni to publish the professional projects they have undertaken. Area of general courses, planned by the teachers of first and second year courses. Area of Conservation and Restoration, planned by the teachers of practical and theory based courses in conservation and restoration or related courses. Area of Humanities, planned by the teachers of theory courses of a historical or classical nature. Area of Plastic Arts, planned by the teachers of courses in plastic arts. Area of Science and Technology, responsible for laboratory maintenance and providing scientific and technological support to the workshops. Run by the teachers of courses related to biology, physics, chemistry, computer science and photography. 10 laboratories of conservation-restoration, equipped with the tools and materials suited to each specialization. 2 biology, physics and chemistry laboratories. 6 classrooms for plastic arts. 1 classroom for computer science. An administration office offering registration services, advice on academic and administrative procedures, student and library cards, allocation of lockers. Library, specialising in conservation-restoration topics, with more than 5,200 books and 2,800 magazines. The professional profile of a conservator-restorer of cultural heritage is one of a highly qualified technical expert able to plan and execute conservation and restoration treatments and to organise and lead projects. He/she will also be able to manage collections and heritage, to take responsibility for preventive conservation, to provide technical advice on aspects of his/her specialization and to do research and teaching. The conservator-restorer must therefore be a competent, responsible, educated and skilled professional who is aware of his/her ethical commitment to society since the preservation of cultural heritage will depend on his or her sound judgment and accurate actions. The training provided in the Conservation and Restoration of Cultural Heritage course is split between basic training, ensuring the acquisition of the interdisciplinary skills and knowledge necessary to act with responsibility for cultural heritage in general and a specialized training focused on the cultural heritage of each of the six specialisations. These studies seek a balance between knowledge of theory, the development of technical skills and the necessary sensitivity to carry out conservation and restoration treatments, as well as being up-to-date with scientific methodology and new technologies. The Conservation and Restoration of Cultural Heritage course is taught over four years and is worth a total of 240 ECTS credits (60 ECTS credits per year). The first two years are dedicated to general basic training. The third and fourth years are specialisation years with specific training being focused on the cultural heritage of each of the six specialisations. All courses meet the criteria set by the European Higher Education Area, and consequently results are measured in European ECTS credits. Most of the courses are bi-annual, but those related to conservation-restoration are annual. Evaluation is continuous. There are two examination periods: one in January and one in June. Timetable is from 8h00 till 15h00, Monday to Friday. The study plan includes both theory and practical training: basic training, compulsory and optional courses, seminars, internships, supervised work and other training activities. To complete their studies, students will undergo a period of work placement as well as producing and presenting a final degree project. The ESCRBCC teaching plan is fully developed and in operation (with courses, credits and allocation). Courses are taught mainly in Catalan however some courses are in Spanish. The abillity to communicate in other languages is also encouraged by using complementary materials (books, articles, attendance at international conferences, etc.). Provision has been made to teach foreign students on temporary assignment in Spanish, if they prefer. The ESCRBCC supplies foreign students with detailed and updated information on Catalan and Spanish courses held each year by the Official Language School (EOI) in Barcelona. The school provides information on the free Catalan courses offered by the Consorci per a la Normalització Lingüistica (Consortium for Language Familiarisation) (CNL) funded by the Generalitat de Catalunya (Government of Catalonia) throughout the year. The ESCRBCC has a tandem language learning protocol for incoming students. It is envisaged that these studies will be recognised as credits in the Learning Agreement, awarded according to the number of hours attended. Erasmus Students are reminded that classes are taught in Spanish and Catalan. However there are some teachers who can speak English and therefore can be of assistance to the students if necessary. Before choosing subjects, students should find out which language the classes are being taught in, especially if they are not proficienct in the language of the country. The school does not run language programmes; however we can recommend some schools. Those wishing to improve their knowledge of Catalan should consider signing up for a course. ESCRBCC exchange programmes with partner institutes in Europe are channelled through the EU’s ERASMUS+ higher education programme. Students from Partner institutions may apply to study with us for one or two semesters. It is not possible to extend courses from the summer to the following winter semester. First apply via your home institution. If you have been selected to participate in an ERASMUS+ program, your home institution must nominate you officially. – Digital portfolio (samples of work). – Academic and professional Curriculum Vitae with contact information. – Brief letter of motivation. Escola Superior de Conservació i Restauració de Béns Culturals de Catalunya (ESCRBCC). We recommend applicants have at least a basic knowledge of the Spanish language (B1), mainly for the most theory-based subjects. Knowledge of Catalan is also appreciated. Admission depends on your portfolio and the number of study spaces available. Partnership agreements between Home and Guest Universities do not guarantee admission. If there is a great deal of demand for a single course or workshop, the ESCRBCC will carry out a selection process and those not admitted to the course or workshop in question will be offered comparable alternatives. The ESCRBCC has no accommodation available for students, but we can try to help you in your search. Accomodation exchange with other Erasmus students. You can also contact the Barcelona Student Housing Service or the Barcelona Centre Universitari (BCU) for help with accommodation during your stay in Barcelona. The Barcelona Student Housing Service website has information about different types of accommodation and how you can secure it. You will receive your student ID card when you start studying at the ESCRBCC, once your enrolment has been fully completed. This card will serve as your official identification for ESCRBCC purposes during your entire study period with us. The sending and receiving institutions will provide assistance, when required, in securing visas for incoming and outbound mobile participants, according to the requirements of the Erasmus Charter for Higher Education. EU citizens will need the European Health Insurance Card or private insurance cover. Before leaving for Spain, you must first complete and submit a European Insurance Card application at the Social Security office in your country. Be sure to bring the card on your trip to Spain. If you have a private insurance plan, you must meet the requirements specified by your particular service provider. Dental care: The Spanish Social Security Service does not cover dental work. However, in case of emergency, you should follow the normal procedure and contact the medical emergency service or dial 112. There is a list of private dentists in the Barcelona business directory (www.paginasamarillas.es). All medical centres are clearly marked with a red cross on all tourist maps. Check for locations nearest your accommodation. Your home and host universities to have an inter-institutional agreement. The sending and receiving institutions to sign a Learning/Training Agreement with you before you leave, setting out the details of your planned activities abroad, including the credits to be achieved. Not to have to pay fees to your host university for tuition, registration, examinations or access to laboratory and library facilities during your Erasmus studies. Full academic recognition from your home university for satisfactorily completed activities during the Erasmus mobility period, in accordance with the Learning/Training Agreement. To be given a transcript of records at the end of your activities abroad, covering the studies/work carried out and signed by your host institution/enterprise. It will show a record of your results with the credits and grades achieved. If the placement was not part of the normal curricula, the period will at least be recorded in the Diploma Supplement. To be treated and served by your host university in the same way as said university’s home students. 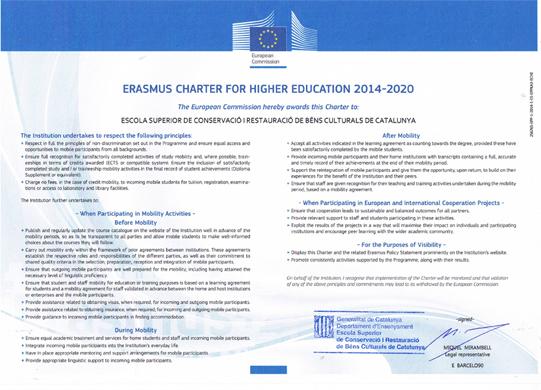 To have access to the Erasmus University Charter and Erasmus Policy Statement of your home and host universities. Your student grant or loan from your home country to be maintained while you are abroad. Respect the rules and obligations of your Erasmus grant agreement with your home university or your National Agency. Ensure that any changes to the Learning/Training Agreement are agreed in writing with both the home and host institutions as soon as they occur. Spend the full study/placement period as agreed at the host university/enterprise, including undergoing the relevant examinations or other forms of assessment, and respect its rules and regulations. Write a report on your Erasmus study/placement period abroad when you return and provide feedback if requested by your home university, the European Commission or the National Agency. If you have a problem: Identify the problem clearly and check your rights and obligations. Contact your departmental Erasmus coordinator and use the formal appeals procedure of your home university if necessary.